Every baby should wear cloth diapers. The benefits to you, your family, your baby, and the environment are endless. A friend of mine who used disposable diapers (my midwife calls them LANDFILL DIAPERS) figured she spent over $5000 to diaper both of her children. In contrast, I have spent under $200 during two children’s diapering years. My second child is using the same diapers and covers I used with his sister. I store the dirty diapers in a plastic action packer container and wash them in warm water. I do not use bleach, but I do use vinegar in the rinse cycle to remove any laundry soap that may remain on the diapers. I also add a little Bi-O-Kleen Bac-Out Stain and Odor Eliminator in with the detergent to eliminate odors. A little squirt of this product in the diaper pail also helps eliminate odors when you open the lid. The most economical covers I have found are the Bummis Super Whisper Wrap. This product is adjustable, so the covers last as your child grows reducing the need to buy many different sizes. Both of my babies were big, so we skipped the newborn size. Cotton Babies has a lot of great products, resources, and even a forum you can join regarding cloth diapering. You can read about the Joy of Cloth Diapers in Mothering magazine. Do the right thing…..– USE CLOTH DIAPERS! amen! I wish every child was in cloth! 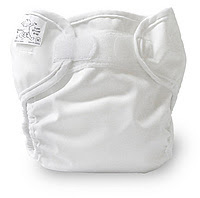 I second cloth diapers for all babies in diapers. Should be mandatory! I just returned from a trip and felt guilty for using Seventh Generation diapers during the trip. I have many friends who have unsuccessfully tried to use cloth diapers, as it does take a committment to persist, which many new mothers are unable to do. My one friend was finally able to figure it out for her third child. Lucky babe! We gave ourselves no other options from the start, and we were lucky to be given many wool biobottoms covers.